Fall is an unbelievable time in the Upper Peninsula. The temperatures this past month or so have varied from 75 to 20 degrees. The winter season has begun, though, with a snow storm that dropped over 20 inches in some places. In Grand Marais proper, we received around 8 inches so far. As usual, the lake effect machine dropped most of its load south of town. All of the pictures featured this month were taken before the snow. There will be plenty of time in the next few months to document the winter scenery. The first few pictures were taken on a couple of trips I took to the Keewenaw and Minnesota to go agate hunting. Those of you who come to Grand Marais to enjoy our beaches are somewhat spoiled. Although I like all of Lake Superior’s beaches, there are not many that offer the wide expanses of sand, rocks, and driftwood as is true in the Grand Marais area. Included are a couple of shots of beaches elsewhere. 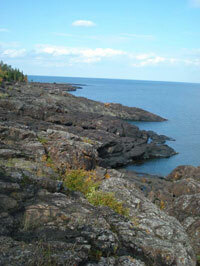 The first was taken on Presque Isle in Marquette. I absolutely love the lava rock and enjoy imagining what it would have been like to see the molten flows inching toward Lake Superior. 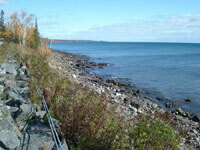 The second shot was taken on the north shore around 20 miles north of Duluth. You can see that both of these areas essentially have no sand at the shoreline. 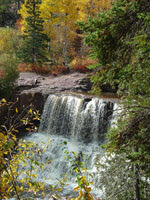 While on the north shore, I spent a little time hiking at Gooseberry Falls. What a rugged and beautiful landscape this Minnesota state park offers. Before the snow started, I took a few last hikes in the dunes. 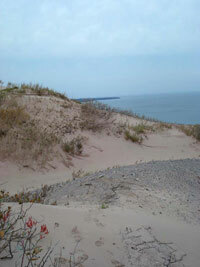 The first shot was taken on the path that skirts the base of the dunes on the Masse Homestead path. This path is located half way between Sable Lake and the Log Slide where the little pull out/parking area is on H58 west. 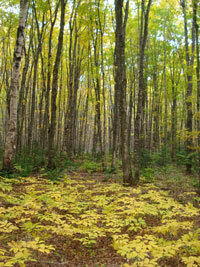 I love the way that the yellows play in this photo between the ferns and the trees. From this path, there are a couple of places you can access the dunes. I did so and walked across to the lake. I’ve included a picture of one of the gravel beds on top of the bluff. It was from one of these gravel beds that the museum founder’s 5.5 pound agate tumbled down the Grand Sable Banks for Axel to find in 1958.